The Rock and Roll Hall of Fame...yes, my friend, that's screaming you're hearing. Now synonymous with controversy (i.e. publicity), the Rock Hall is the manifestation of what happens when "expert tastes" collide with fans' subjective feelings about an art form that means a hell of a lot to them. Year after year, the Hall's committee and voting body make a very tricky attempt to formalize the value of popular music artists by way of induction. In essence, they're throwing down popular music's version of a Supreme Court ruling with every announced Rock Hall class (yes, there is a fan vote, but let's not overstate its impact). This process is kinda acceptable to some, infuriating to others, and let's face it, probably ignored by the vast majority of the American populace (probably millennials and anyone over 60). Still, this institution persists, just like the shrill, often Midwestern-based howls of protest for the overdue inductions of such artists as Deep Purple, Chicago, The Moody Blues, and Yes. 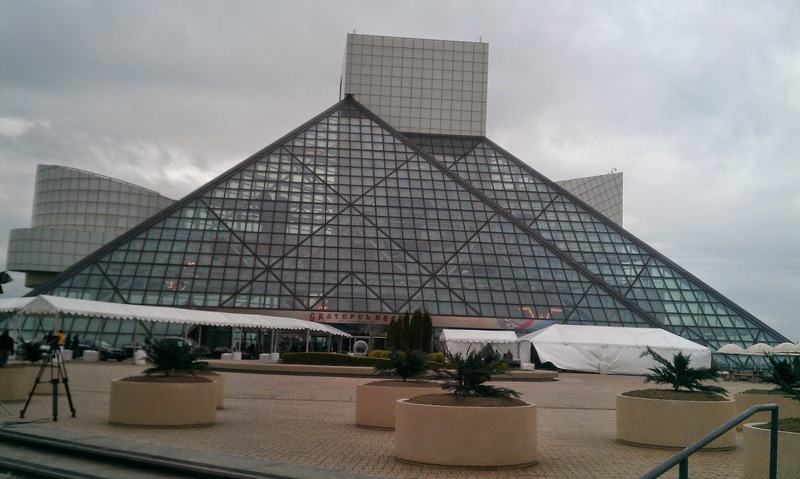 Apart from the ceremonies and HBO broadcasts, the Rock Hall has been physically embodied by a glass pyramid building on Lake Erie since 1995. For all its legitimate merits, this entire enterprise could be justifiably accused of flaunting elitist, high-art pretensions as populist in an economically depressed, working class Rust Belt city. This is especially noticeable when the ceremony is actually held at Public Hall in downtown Cleveland, as it is every three years. In Ohio, the entire Rock Hall thing can seem akin to that pinky ring-wearing, fat-cat rich couple that go slumming in the dance club in ZZ Top's "Sharp Dressed Man" video. As far as this year's class, I have plenty of issues of my own with the inductees (Green Day? ), presenters (Miley?! ), or the rather murky nomination/induction process (oh, Jann Wenner...you really wanted the Paul Butterfield Blues Band in, didn't you?). Despite such protests, it's still a magnificent show - the ultimate rock concert. So I'll pick the Tre Cool and Cyrus anchovies off an otherwise delicious pizza and enjoy. As a dead-serious lifelong music fan, it's a rare opportunity to be in the same room with so many icons and see speeches and performances that will never happen again. I'll never forget how cool it was, in 2012, to see folk legend Donovan sing "Sunshine Superman," witness Chris Rock giving the Red Hot Chili Peppers' induction speech, or see The Faces (with the since-passed keyboardist Ian McClagan) just blow the roof off with "Stay With Me." These are peak-experience, Halley's Comet-like moments for me, like seeing Tom Waits at the Wiltern in 1999, or watching the original five members of Guns N' Roses open for Aerosmith at Merriweather Post Pavilion in 1988. The HOF ceremonies used to be closed-door industry events held at the Waldorf-Astoria in NYC, but they were eventually opened to the public in 2009, with the galas rotating between Cleveland, Los Angeles, and NYC. I used to watch the clips of the annual events on MTV in the early 90s, and read about them in Rolling Stone. However, they seemed to happen on another planet, and never did I dream I'd someday be able to attend. But then again, rock and roll is a universal language and it should be inclusive, especially by way of race and gender. So yes, closet racists/sexists, that means Run D.M.C. (inducted), Public Enemy (inducted), Grandmaster Flash (inducted), N.W.A. (not yet inducted), Donna Summer (inducted), Janet Jackson (not yet inducted), Pat Benatar (not yet inducted), and many, many others all deserve a place at the Rock Hall table. Deal with it. But back to the 2015 ceremony. This year, McCartney inducts Ringo, so there's that "seeing the living Beatles perform together in person" thing. That alone is worth the price of admission. Otherwise, Joan Jett will jam with Dave Grohl; Double Trouble, Stevie Ray Vaughan's sharp backing band, will perform with Gary Clark, Jr.; the poetic Patti Smith will induct Lou Reed; Beck will do a Reed tune; and guitar alchemist Tom Morello will churn out some Paul Butterfield Blues Band riffs, and plenty more. When it's all over and the final notes of "With a Little Help From My Friends" bounces off of the walls of Public Hall in Cleveland, another group of artists will be officially enshrined, and if nothing else, a tremendous concert will have taken place. Long live rock... and oh yeah, can we please induct Devo, N.W.A., Black Flag, Captain Beefheart, New York Dolls, Warren Zevon, The Cure, Depeche Mode, Nick Cave, Cheap Trick, Judas Priest, Iron Maiden, and Jane's Addiction? Appreciate that, Jann. Good stuff! Patiently waiting for Janet Jackson's nomination and induction. It's time! Thanks, Induct Janet! Have to think Janet will be nominated soon.